Home » SPHP in the News » Times Union: Is Six Months Key to Overcoming Opioid Addiction? The Times Union recently published a new story in its ongoing series dedicated to the growing opioid epidemic in the Capital Region. This story focused on treatment gaps and included data from a new Siena College Survey of more than 600 professionals in the medical, mental health, social service, nonprofit, and law enforcement fields. Dr. Melissa Weimer, chief of behavioral health and addiction medicine for St. Peter’s Health Partners, discussed the clinical aspects of treating opioid use disorder. 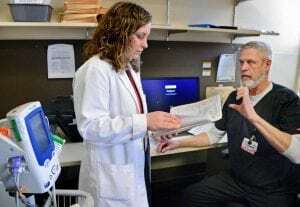 “The scary thing about opioids is that once you make it through acute withdrawal, unfortunately there’s a stage called post-acute withdrawal that can actually last six months to a year — particularly if you’re a person who has been using for a very long time,” Weimer said. The symptoms are mild compared to acute withdrawal, she said, but frequently contribute to relapse. There is medicine to lessen these symptoms, she said. A doctor might prescribe selective serotonin reuptake inhibitors (SSRIs) or non-habit forming clonidine or hydroxyzine. To view the Times Union article, click HERE.